Algeria's President Abdelaziz Bouteflika has stepped down following mounting pressure from the people and the army. But just how powerful is Algeria's army and what role might they play in the months to come as Algeria prepares for its elections? "Algeria is an army that has a state….Tunisia is a state with an army” ," Michel Ayari, International Crisis Group North Africa analyst told VOA. But to what extent is this generalization true? Algeria is now undergoing its own shake-up, after its regional neighbours completed their 'Arab Spring' in 2011. Many of those countries are still reeling from the after effects and questioning if it is, in fact, better now than before. Articles and analysis currently abound pointing to the parallels between Egypt and Algeria. In both cases there is a president too comfortable with power and blind to the reality on the street. Until the people spoke up, that is. Their voices, however, were only made audible because in each time the army did not interfere. In Egypt, the people took to the street demanding that Hosni Mubarak step down as president after being head of state for over 30 years. Pictures flooded the internet and social media of people grabbing naps in army vehicles. I this case, the army refused to back Mubarak and instead supported the people. After Mubarak stepped down and elections were held, nearly a year into the new mandate of Islamist president Mohamed Morsi, the people once again took to the streets. That time they wanted an end to Morsi's presidency. Again the army took the side of the people and the then Chief of Staff, Abdel Fattah al-Sisi, was lauded by the people for having saved the country from Islamists as he announced the army would ensure an end to Morsi's term. Some refer to that moment as a second revolution, while others refer to it as a military coup. But since then, there has been no question as to the role of the Egyptian army. The case of Algeria is similar, but not the same. But what can't be avoided here is the fact that like Egypt, the army is an integral part of the country. “The Algerian army is quite powerful and the origins go back to the independence, to the liberation war against France” explains Tahir Kilavuz from the University of Notre Dame, who specializes on regime change in the MENA region, with attention to Algeria. He adds that the army was essentially created from the war of independence in 1962 and it continued on afterwards as an independent Algeria was emerging. “Even though the first president was a civilian, the army had strong control, and two to three years after independence, Algeria had its first coup d'état, and the army general, the chief of staff, became the president at the time, which started the on-going dominance of the arm in Algeria” explains Kilavuz. Since that time, the army “has always been one of the biggest and most important components of the Algerian regime, along with [the] presidency and the party”. And this role for the army was especially fortified in 1992 when it intervened in the elections that were likely to see an Islamist party take power. That intervention plunged the country into a civil war. Abdelaziz Boutflika came out from that civil war as the architect of peace following Algeria's years of fighting. 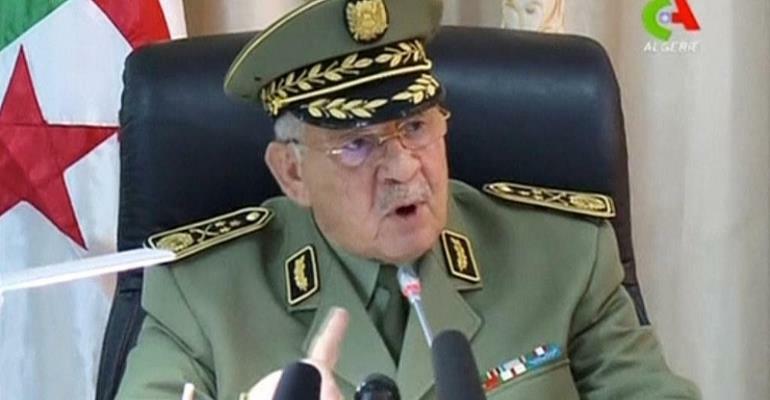 “The army is a real power in Algeria, but the Algerian army is mad up of people. It's not like only privileged people can join the army, the people can join the army. That's why it's called ANP, which is the Armée Nationale Populaire [National Popular Army in english]” explains Narriman. The fact that one can join the army having come from a modest background already sets it apart from other militaries around the world where it is normally a privilege to join the ranks, especially when it comes to upward mobility. One could argue that this point humanizes the Algerian military. Boutflika himself appointed Ahmed Gaid Salah as chief of army in 2004, and so his association with the former president has some depth. When protesters took to the streets on February 22nd demanding that Bouteflika not run for a 5th term, Salah was still supporting the ailing president. But late last week Salah called for the use of Article 102, a provision whereby the Constitutional Court can declare the position of the president vacant if it is deemed he, or she, is unfit to rule. Earlier this week the army chief of staffed called on the country's top court and parliament to trigger Article 102 of the constitution. This has placed him in a favourable position with the Algerian people. When the Egyptian people demanded that Morsi be removed from power in 2013, Sisi issued an ultimatum to the Islamist president and reportedly told him in a conversation:"The army follows the will of the people and most of the people, according to reports, do not want you." From that moment on, Sisi was propelled into the spotlight as a supporter of the people. And Salah, just like Sisi, has managed to keep the army not only afloat, but popular. The army is not only a military power, but also an economic one. “The [Algerian] army is not only the military or political power it is also an economic power in [the] Algerian political system” explains Kilavuz . Just like Egypt, the military's economic presence is entrenched in much of the country's enterprises. “All the big businesses belong to a general or their kids” says Narriman when referring to Egypt. While Algeria is now coming to terms with a new reality, according to its constitution it must put in place a transitional government for 90 days until the next election. Kilavuz says it's very likely that the military “will try to seize more power, or if not more power, they will try to keep the status quo as much as possible” given this current movement is trying to put in place a more democratic system which means a complete revamping of the system. “The system is pretty much connected with the army's power, so clearly the army doesn't want an entire transformation of the system” he adds, noting instead that there will likely be concessions made from the army. Just like Egypt, the people's call for change was answered, but this change came via Sisi, a former head of army staff who has kept up the power of the military.